Spring cleaning has been a seasonal ritual for generations that is spurred on by an innate urge to ready the home for warm-weather fun and engagements. In today’s modern world, many homeowners in the Inland Empire are taking the time to get their HVAC systems ready for spring and summer as well. The following five products, services and strategies can help ensure that your home stays cool and comfortable when outdoor temperatures soar. A few preparatory steps can help your energy costs remain manageable as well. Air conditioners are complex pieces of machinery designed to keep your home at an ideal temperature. Cooling systems are subject to frequent stops and starts and long periods of continual use. Just as your car needs regular tune ups to keep it running efficiently, seasonal inspections for your air conditioning system are necessary to prevent damage from wear and tear as well. Preventative maintenance extends the service life of your cooling system. Because a well-maintained air conditioner operates at up to 25% better efficiency than a neglected system, you’ll enjoy lower operating costs too. 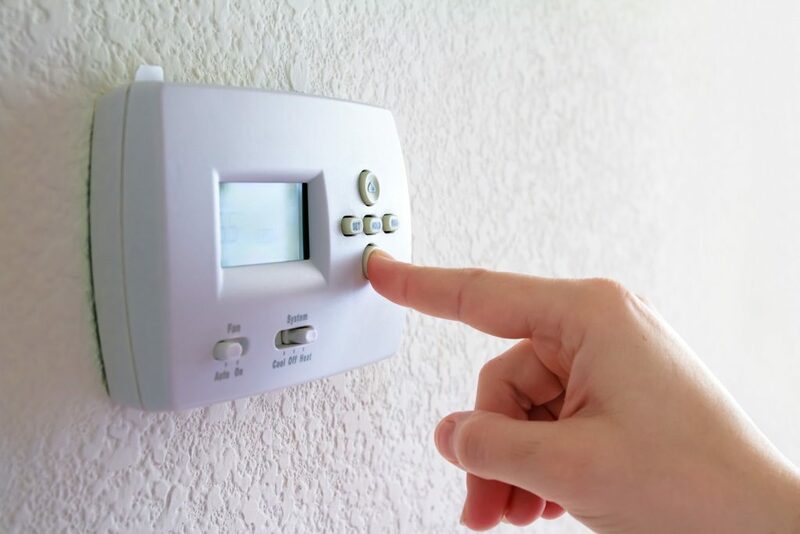 Setting your thermostat to keep your home cool 24 hours a day can send your energy bills skyrocketing. A programmable thermostat allows you to enjoy the same level of comfort and save money too. Scheduling the device to raise the temperature setting while you’re asleep or away from home can cut your energy bills by 10% or more. For added convenience, choose a Wi-Fi enabled model that lets your program the thermostat from your computer or mobile devices. A few affordable home improvements can make it easier for your air conditioner to keep your home cool, saving you money without compromising comfort. A ceiling fan, for example, can make a room feel five degrees cooler and costs just pennies an hour to operate. Around 20% of heat that enters your home comes from direct sunlight. A few strategically planted deciduous trees can shade your home during the winter yet allow sunlight to filter through in the winter. Leaky ductwork can reduce the energy efficiency of your cooling system by as much as 25 percent, according to the Environmental Protection Agency (EPA). A pressure test conducted by the experts at Inland Valley Heating & Air Conditioning can determine if your AC system’s ductwork is wasting energy and money. We can also seal and insulate your ducts to eliminate leaks and enhance your cooling system’s efficiency and performance. At Inland Valley Heating & Air Conditioning, our technicians are experts at identifying energy-wasting areas in your home. Whether you need a whole-home energy assessment, preventative maintenance or a brand new installation, you can depend on Inland Valley Heating & Air Conditioning to help you and your family stay comfortable in every season.